Droplet Digital PCR (ddPCR) technology is a digital PCR method utilizing a water-oil emulsion droplet system. Droplets are formed in a water-oil emulsion to form the partitions that separate the template DNA molecules. The droplets serve essentially the same function as individual test tubes or wells in a plate in which the PCR reaction takes place, albeit in a much smaller format. 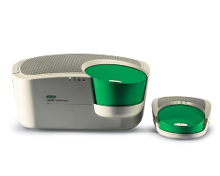 The ddPCR System partitions nucleic acid samples into 20,000 nanoliter-sized droplets, and PCR amplification is carried out within each droplet, compared to qPCR and traditional PCR, a single sample offers only a single measurement. This technique has a smaller sample requirement than other commercially available digital PCR systems, reducing cost and preserving precious samples. Using the ddPCR system we can accurately quantify the absolute number of copies from microbes, genes, copy numbers, and rare mutants. We have validated ddPCR assays for common Vaginal microbes that quantify levels. Microbes that can be detected include: Gardnerella vaginalis, Prevotella bivia, BVAB2, Neisseria gonorrhoeae, Lactobacillus crispatus, Lactobacillus jensenii, Lactobacillus iners, Lactobacillus gasseri, Megasphaera 1, Atopobium vaginae, Mycoplasma genitalium, Mycoplasma hominis, Ureaplasma urealyticum, Trichomonas vaginalis, HSV2, Human papillomavirus type 16, Human herpesvirus 1, Hepatitis C virus, Hepatitis B virus, Human immunodeficiency virus 1, Candida glabrata, Candida krusei and Candida parapsilosis.